I got an email the other day from someone who purchased Elegance Knit and couldn't understand some of the symbols used in the pattern on page 40. It was a fairly complicated symbol, and took me a few minutes to figure it out. And of course, not wanting to waste a single minute of coherent thought, I want to share my reasoning with you guys. You might need to do a similar analysis at some point, and I could be abducted by aliens or the NSA and not be available for consultation. So, let's take a look at the top symbol. Obvously, the circle stands for The Rising Sun. Notice how it's nestled in a valley, with a tranquil stream wandering peacefully around the bottom of the mountain. The gray shadng implies a gentle mist, covering all in mysterious calm. This interpretation clearly illustrates that no matter how confused I get, I can always make stuff up that sounds believable. However, after this brief thought flitted across my brain, I realized that it wasn't going to be possible to knit these three stitches, mainly because I have never heard of The Rising Sun stitch and couldn't find any reference to it in any of my stitch dictionaries. So, I revisited the brain cell in charge of Japanese Knitting Symbols and worked it out this way. 1. 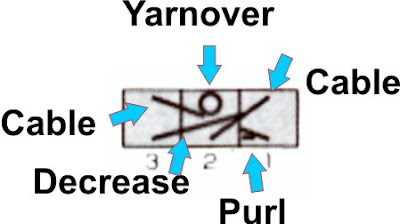 The symbol incorporates a three-stitch cable, a decrease, a purl stitch, and a yarnover. The gray shading merely indicates that it's called out of the main pattern graph as a special maneuver. 2. Because the numbers underneath clearly show a right to left reading, I started on the right side of the symbol. 3. The first thing we see there on the right is a little underline, which, if you recall from my previous post on Japanese knitting symbols, indicates a purl stitch. 4. The cable is travelling to the right. Therefore, the first stitch is placed on a cable needle and dropped to the back. We'll revisit this stitch later. 5. Now we have two stitches. The decrease symbol indicates that we knit them together and follow that maneuver with a yarnover to a) keep the stitch count the same and b) to keep this yarnover in line with the ones in the rest of the pattern. You can't see the rest of the pattern, but I can, nyah nyah. 6. Finally, we pick up our first stitch from the cable needle and purl it. Moving right along to the bottom symbol, we have a yarnover, a purled stitch, a right-travelling cable, and a decrease. 1. The first maneuver is a yarnover, for same same reasons as described in #5 above, that is, to keep the stitch count the same and line up the yarnover with others in the pattern. 2. Then we drop stitch #1 to the back. 4. Pick up stitch #3 and purl it. I leave the middle two symbols to you folks as homework. :-) -- which means, from right to left, cable the first stitch around to the back, purl the second, and then knit the next stitch together with the cabled stitch in the front loop and then the back loop. Jeezopete. My head just exploded. Frankly, Lori, I think the NSA should be decrypting these symbols for us. After all, we the taxpayers are fronting your salary and the tons of hardware you guys bought at inflated prices. I have just finished writing the post about the basket, and will upload it tomorrow or Friday. Still trying to unwind the audio bug from the Trenna. Oh my! Thank goodness there are people like you in this world willing to clarify for the rest of us. You're making this up, right? But obviously not as you go along. This took planning. If you are NOT making this up, and Japanese actually knit like that, then I don't know what to say. Well, I do know what I'd like to say (the Japanese are a bunch of cuh-razy whacked-out knitters), but that's hardly appropriate in a public space, right? Oops. What I mean is, that's so Japanese, to take something, fiddle around with it, and come up with something much, much more advanced. Ask GM! Hi, I just want to add to your description under bullet 5. Those two stitches are not actually knit two together as in k2tog. You need to knit them so that the right stitch (stitch 2) is in front of the left stitch (stitch 3). They indicate this by extending the stitch 2 line all the way to the top of the box, while the stitch 3 line merges with that of 2, i.e. stitch 2 dominates 3. I'm not sure that I understand your explaination, but I'd be willing to trust you on it if I were insane enough to try to knit such a thing. Ugh, my brain hurts just thinking of it. ... 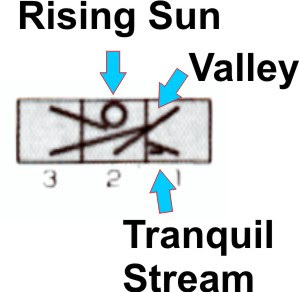 In the bottom symbol that you discuss, shouldn't the maneuver be purling together the two sts, rather than knitting them together? There's a horiz. purl line at the base of the decrease. Purling would also make the L st on top nicely. But I only say this because I was just looking at this very symbol yesterday, trying to figure it out. And, of course, I am not a pro at Japanese Symbol Interpretation! Here's what I got from my Japanese knitter friend, so at least she and I agree. purl 1 from the cable needle. Symbol 2: slip 2 stitches onto cable needle, drop to front, p1, yo, ssk the 2 stitches from the cable needle. p1, ssk the 2 stitches from the cable needle, yo. p1 from the cable needle. Thank you for your lyric clarity, your inventive discriptions, your...oh heck, I still didn't get it. But thanks for trying to instruct us anyway. Always entertaining! What? You gotta' problem with a $900 toilet seat? Or a $400 hammer? You'll be happy to know our software costs marginally less--only $275 for a box of 20 CDRWs. And we get our ketchup for the employee cafeteria at the low, low price of $27/bottle. It's not like we're wasteful, or anything. Geez. Hmmm...wonder if I could requisition some cashmere for help with this new subversive knitting case? The GOV would prolly pay $800 dollars a hank. Wanna' sell some of that you've got stashed in your basement? I swear I have no yarn stashed in the basesment. Ha ha, NSA. Guess you need to recalibrate your satellites. What you interpreted as yarn is actually five million yards of climbing rope! I am sure you can persuade someone to sell you 300 yards of cashmere for $800. Ask Sue at Little Knits. She would probably be delighted to serve you! So you've moved the beigy-colored stuff to a secret location...I'll call a meeting. The tranquil stream cracked me up. When I'm having lace knitting difficulties, you can put me right beside a tranquil stream, in the middle of gently waving grass and flowers, under a warm, golden sun with a gentle breeze... and I'll probably be swearing like a sailor and telling everybody to shuddup because I'm trying to figure this out. Oh, and what was in the yarn gift basket? This just makes my brain hurt, too. It sounds like that old game of Twister to me. 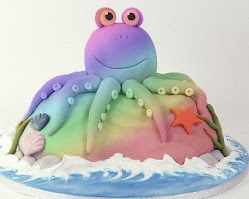 I just came across your blog and I think you might be the help I've been searching for. I have several Japanese knitting books and no idea how to read them. Can you recommend a symbol book or be willing to help out with the more difficult symbols? Go here to see several books that might be helpful. And if you want me to answer you personally, you will have to provide an email address :). No, I'm pretty sure your first illustration is correct. I just sat down with this book today (to swatch) and was very glad I remembered this blog post of yours. What's really odd (on another patt) is that I could never learn the tubular cast-on from English sources, but the Japanese schematic in the back of the book made perfect sense. Replying to a very old post since I just started reading your blog, but I can't help but see that complex symbol as a stick-figure who's falen down drunk. Black Widow Spider King Shawl--Center Completed!